Ruin, Battery, and all your favourite Specialists have returned for Black Ops 4, and they’ve brought some new friends with them. Black Ops 4 is bringing Specialists back to Call of Duty. Treyarch’s hero-based class system, first introduced in 2015’s Black Ops 3, has been expanded, customised, and perfected as an whirring cog in the intricate machinery of Black Ops 4’s multiplayer. With ten Specialists available for players to unlock and customise, including returning recruits and a handful of fresh faces, Treyarch is placing a hard focus on cooperation, composition, and customisation for this year’s season of Call of Duty multiplayer, as Design Director David Vonderhaar explains. Specialists will also have their own unique character-specific Combat Training missions, contextual objectives to complete during multiplayer matches, which are designed to flesh out the backstories of the soldiers you’re playing as. This will be a new, holistic source of storytelling for Black Ops 4 in the absence of a traditional single player campaign, allowing Treyarch to more subtly craft a narrative backdrop to the PvP firefights that Call of Duty is known for. Besides the gameplay variation they bring, Specialists are also there to simply add character and personality to Black Ops 4’s future dystopian setting. You won’t just be playing as a faceless grunt in multiplayer matches, but part of a diverse cast of super soldiers, each with their own play styles, skills, and idiosyncrasies. 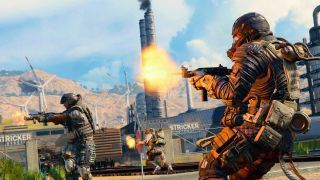 Whether you’re healing and resupplying your teammates as Crash or racking up revolver kills on the frontlines as Seraph, Call of Duty: Black Ops 4’s crew of Specialists are just ten more reasons to jump into its multiplayer later this month.